The Archaeological Survey of India (ASI) has found a 12th-century Vishnu idol among several other interesting artefacts during its ongoing excavation at the Purana Qila. The 18-cm-tall stone idol dates back to the Rajput period. The idol, which has conch and a chakra (wheel) — symbols associated with Lord Vishnu — was found at the southeastern corner of the Purana Qila excavation site. The ASI started excavating the site last month after almost four decades. The fort saw excavation for the first time in 1955 by famed archaeologist BB Lal. Later, the ASI had carried out excavation during 1969-73 too. The earlier excavations had brought to light artefacts from as far back as 3rd century BC. 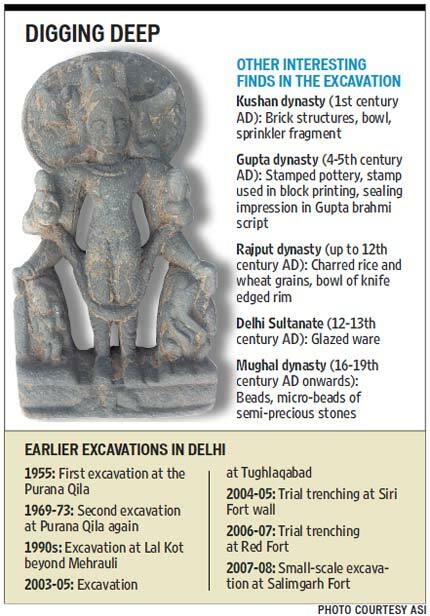 The current excavation has also yielded Kushan-era (1st century BC) pottery and toys along with a medieval-era copper coin, terracotta figurines of animals and humans from both the Rajput and Kushan era, said Vasant Swarnakar, ASI’s Delhi circle chief. The excavation is being carried out to verify and establish if there was a presence of PGW (painted grey ware). “The Purana Qila mound contains remains of a continuous cultural habitation starting from Mauryan period (3rd century BC) to the Mughal period. This is believed to be the site of Indraprastha related to the Mahabharat. We wanted to dig deeper to verify and establish, if we get any PGW to link it to that time,” Swarnakar said. Another reason why the ASI is re-digging the site is, unlike previous times, the agency also plans to leave the excavation trenches open — albeit covered with sheds — to turn it into an on-site museum to showcase the different cultural habitations. Considering that Delhi is vying for a space on the list of UNESCO’s ‘World Heritage City’, the museum will be a valuable addition to Delhi’s pitch for the coveted spot.